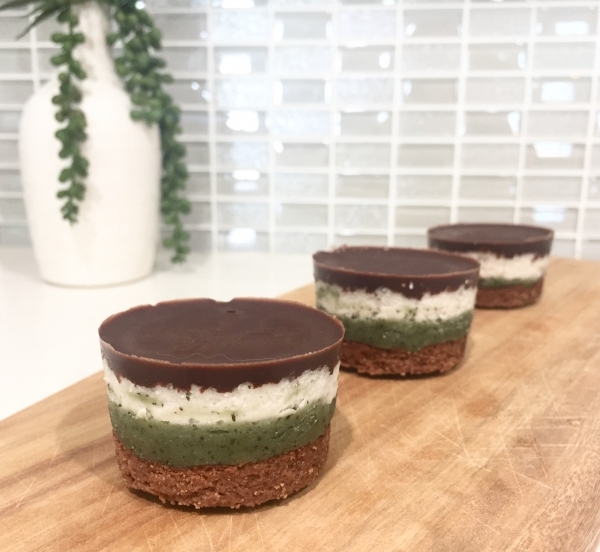 This recipe is an absolute delight if you love chocolate and mint with a splash of coconut cream flavour on a delicious crumbly biscuit bottom. If you don’t like mint, simply leave that out of the recipe. Although this recipe is not difficult, it does take some time to prepare but the time taken is well worth the effort for the end result. You will need a thermomix or strong blender for this recipe as it requires a tool that has the capacity to blend nuts into a paste like consistency. There are four layers in total but you can choose how many layers you want and change the recipe up a little and also allow for less preparation time. This recipe contains no dairy and if you wish to make it nut free, you can change the biscuit base made from almond flour by using any seed flour or coconut flour combination. You will also need mini round cardboard baking cups for this recipe. These will be used as the mold for the entire cheesecake and they should be 5cm wide measured from the bottom. You can find these in most discount stores. if you are searching at Easter time, you may find something colourful. Alternatively, you may wish to find something fancy to serve your cheesecake medallions for a high tea occasion perhaps.